Have you always wanted to own your very own sports bar? Well, now is your chance! 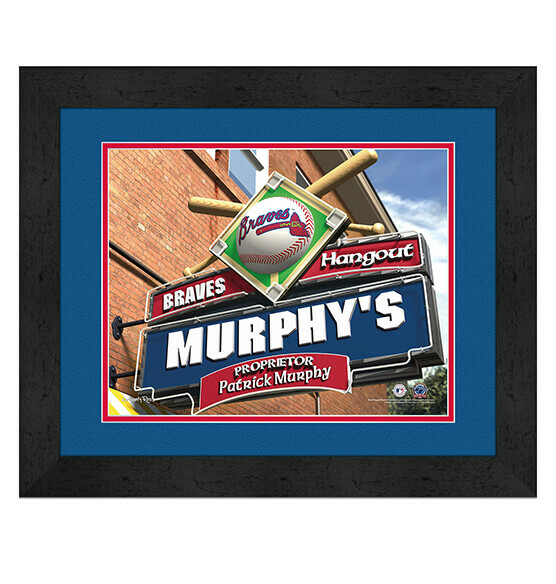 Our Atlanta Braves MLB Personalized Pub Sign Wall Art decor lets you personalize this custom-printed framed artwork to your specifications. Use a first name, last name, or even a nickname to add a personal touch. This premium personalized sports decor will look fantastic hanging in your fan cave, home or office. It features clear glass, team colors and a sleek black frame that always looks great. Bonus: it comes ready to hang with a sawtooth hanger for easy mounting.